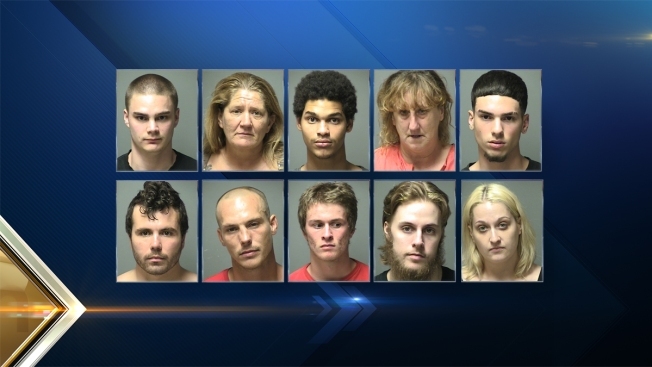 These 10 individuals were arrested by Manchester Police as part of a warrant roundup this week. Ten people were arrested as part of a warrant roundup conducted by the Manchester Police Department's gang offender strike team on Thursday. All of the individuals were arrested on outstanding warrants for misdemeanor and felony level offenses. James Jenkins, 22, of Manchester, on an outstanding warrant for simple assault. Laurie Jefferies, 52, of Manchester, on an outstanding warrant for simple assault. Michael Ayers, 20, of Manchester, on an outstanding warrant for false report to law enforcement. Tuesday Sirrell, 51, of Manchester, on an outstanding warrant for theft by unauthorized taking. Brenno Rabello, 18, of Manchester, on an outstanding warrant for riot and a violation of bail conditions. Shawn Powers, 27, of Manchester, on an outstanding warrant for theft by deception and receiving stolen property. Eric Rheault, 31, on an outstanding warrant for burglary. Logan Howe, 18, of Manchester, on an outstanding warrant for theft of a motor vehicle. He faces additional charges of resisting detention, conduct after an accident and false report to law enforcement. Tyler Newman, 33, of Hooksett, on an outstanding warrant for operating after suspension. He faces additional charges of possession of Fentanyl and possession of Clorazepam. Renee Amirault, 30, of Manchester, on an outstanding warrant for two counts of simple assault and one count of criminal threatening.